Designer babies with DNA from three parents could be born in Britain in as little as three years. The intent is to help couples with incurable genetic diseases have healthy children with the burden of inevitable illness. The technique allows researchers to swap out the damaged DNA in a fertilized embryo with healthy DNA from a third person. I've covered this general story before; see Three Genetic Parents? How About Seven? for an sfnal example of multiple parents from a 1940's story. Can you think of other examples in sf for the designer baby idea? 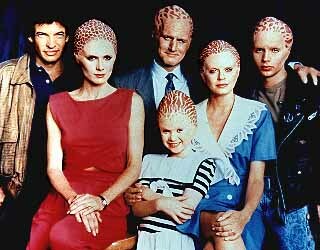 In the series Alien Nation, the Newcomers are genetically bred and perfected humanoids with a variety of characteristics superior to those of ordinary human beings. Via Daily Mail; thanks to Moira for the tip.